My name is Courtney and I have CF (cystic fibrosis) https://www.cff.org/. Most of my days are filled with the never-endless adventures of being a wife and mother to two awesome kids and two fur babies; however, I have had to deal with the burden of CF since birth (5 weeks to be exact). Most of my life seemed pretty straight-forward, and as I look back now, easy. I had ups-and-downs, but my ups-and-downs significantly increased as I got older. I have been hospitalized 5 times (about 30 days) in the last year with a combined total of 5 PICC lines administering 14 weeks of meds, been put on supplemental oxygen, and have been struggling to put weight back on after losing 14 pounds. This does not even include the day-to-day routine of breathing treatments that I spend two or more hours on each day. Some people who know me don't even know I have CF because I do not want it to be the focal point or defining factor of who I am. Times have changed; however, and I am in need of a lung transplant. Truly exciting, it is, and nerve-racking at the same time. The waiting game has started and while I wait, as patiently as I can, I kindly ask for your help. What do we need help with? Due to the cost of post-transplant needs that aren't covered by insurance, such as certain medications, rent/housing at the post-transplant recovery facility that could be two or more weeks, food, parking fees, and our normal bills and mortgage, we will be in a bind. We will not have a source of income to depend on while my husband helps me recover. I am asking for your generosity to help me succeed with my transplant. I am looking forward to this journey and with your support it will help guarantee my success. Thank you!! I am very excited to announce that after 167 consecutive days in the hospital, Courtney is home!!! A little over a month after receiving her double lung transplant at Duke University Hospital, she was discharged this past Monday. We will remain in North Carolina for at least the next few months as she completes physical therapy and attends weekly follow up appointments at the Duke Clinic. Thank you again to everyone who has helped to make this possible by contributing to her GoFundMe campaign. We are extremely grateful for your support and could not be more excited to have her back home and breathing again. Let me start off by saying thank you to everyone for your support. Without all your prayers, encouragement, and donations, we could not have made it through this. It has been a very long 17 months since Courtney’s GoFundMe campaign was started so let me recap for you Courtney’s journey to transplantation. 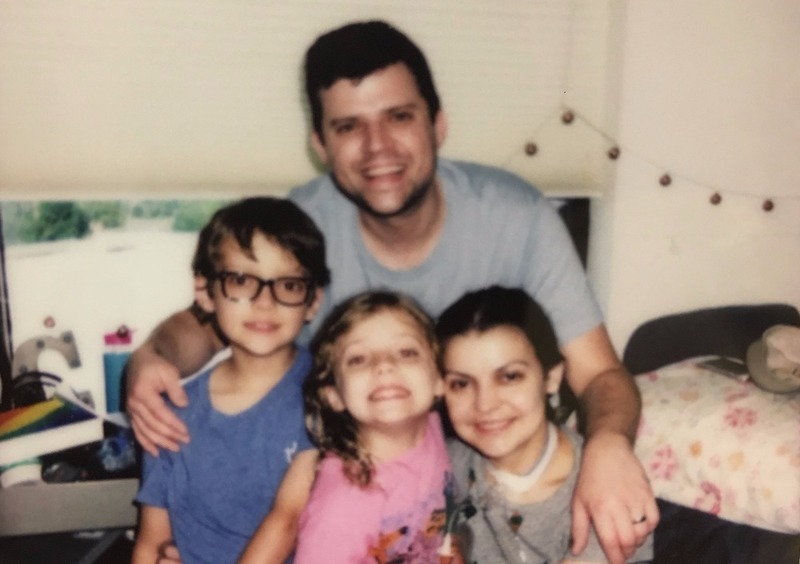 After waiting on the lung transplant list for well over a year at Emory Hospital in Atlanta, we realized that we had to act and do something before it was too late. Courtney had a very high level of antibodies that would prevent her from accepting lungs from a high percentage of the population. 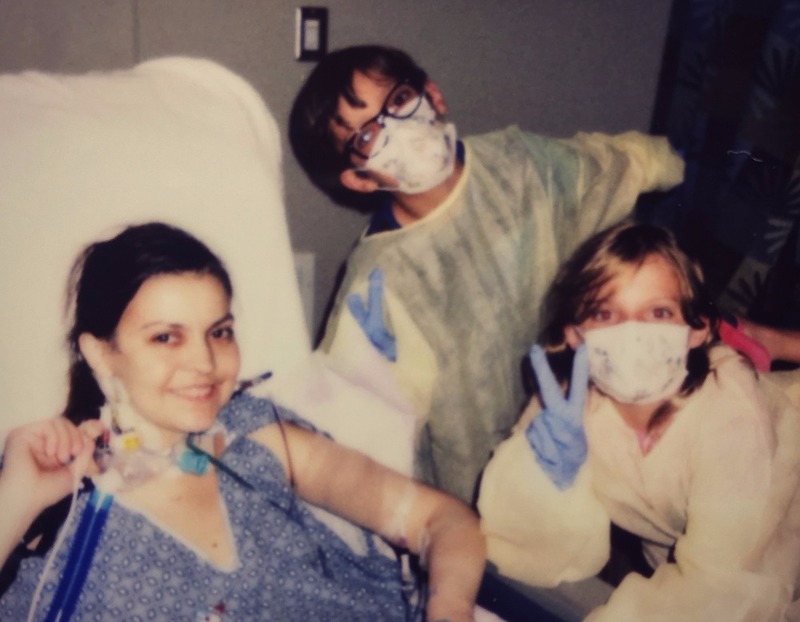 This made it very difficult to find a donor whose lungs could be safely given to Courtney, and because of this we needed access to more lungs than Emory could provide. 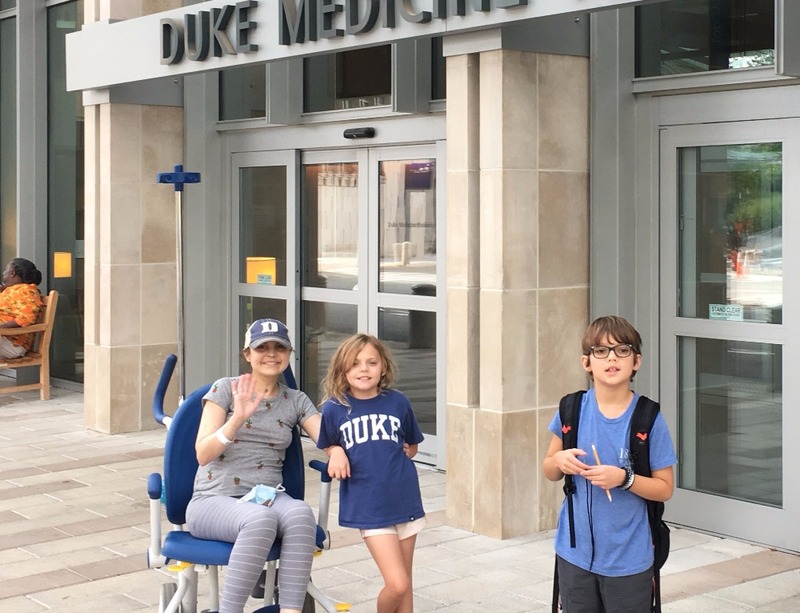 After doing some research and visiting a few transplant centers, we decided that Duke University’s highly rated transplant center would give Courtney the best chance of survival. On February 25, 2017, we picked up and moved to North Carolina so that Courtney could be listed for a double lung transplant at Duke. I quit my job, we pulled the kids out of school, and we rented a house in Chapel Hill about ten miles from Duke. On March 1st, only a few days after our relocation, Courtney was rushed to the hospital in an ambulance. She had a severe infection not only in her lungs but also in her bloodstream. This required her to be intubated and placed on a ventilator, which she would end up being on for the better part of the next four months. Courtney’s four month long pre-transplant stay at Duke started with her in the ICU getting a tracheotomy and as I mentioned being placed on ventilator support. While in the ICU, she also had to receive a blood transfusion which caused her already high antibody levels to increase even more. Following this transfusion, Courtney’s antibody level increased further making the likelihood of finding a matching donor even more challenging than before. The doctors did not express a whole lot of optimism toward finding a match for her in time and they even explored alternative solutions such as a living donor lobar transplant. Courtney never gave up, even when things were at their worst. She fought hard and pushed herself every day. She knew that hundreds of people were out there praying for her and God gave her a feeling of assurance throughout the hospital stay that everything would be okay. We knew that she was going to get the right lungs and at the right time, we just didn’t know how long that would be. In early May, after multiple ups and downs, the bacteria that was infecting Courtney’s lungs became resistant to the antibiotic that was fighting it. Her lung strength deteriorated further and even though she had been started on a new antibiotic called Avycaz, she was very ill and retaining a significant amount of CO2. Courtney had never been exposed to Avycaz before and it really worked wonders. She did a complete turnaround and within a couple of weeks, she was in the best shape of her entire hospital stay. While her lungs still needed replacing, they did show small signs of improvement and she really pushed herself in physical therapy to the point that she could walk a mile while on a portable ventilator. This was truly a testament to her hard work and other pulmonary patients on the floor were inspired by her strength and will to live. Seeing how strong she had become, the doctors decided that her body could handle more than they previously thought and they began to craft a plan to “desensitize” or lower her bodies production of antibodies to allow for a larger donor pool. Courtney continued to work hard every day despite being exposed to some very potent drugs as part of the desensitization plan. Eventually the plan paid off and significantly reduced the level of antibodies she had. This greatly increased her chances of finding a match, and on the morning of July 3rd she finally got her call! A set of lungs had been found for her. She would undergo surgery and have her new lungs put it during the early morning hours of July 4th. It was truly a miracle not just that she was able to be transplanted, but how well her surgery and recovery went. Despite being on ventilator support for so long, she was completely off oxygen and breathing room air within a week of surgery. She also got right back to walking, talking, and eating. Her hard work prior to transplant paid off as she has recovered at a much faster pace than her doctors were expecting. She is now in the stepdown unit of the hospital and we are anticipating her to come home on Monday, July 24th! We are so excited and looking forward to having our family back together under the same roof. 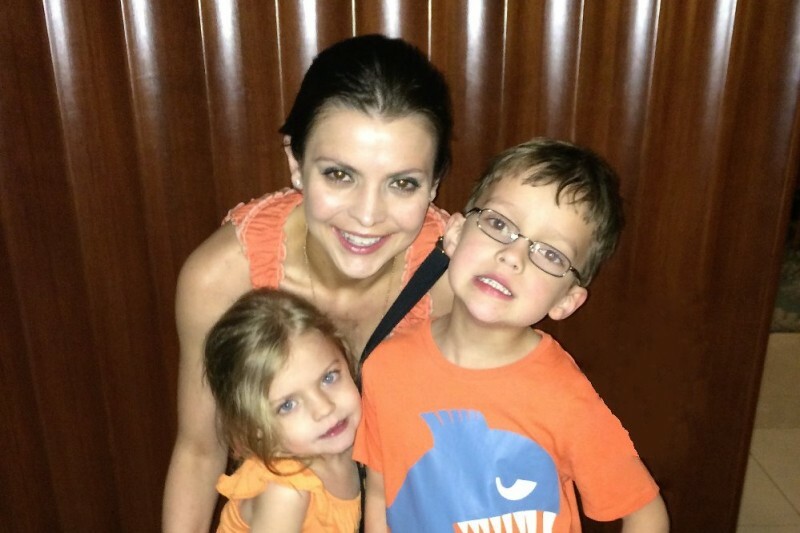 Courtney’s transplant journey is an incredible story and truly a miracle of God. We want to thank everyone for your prayers and well-wishes during the past few months and to everyone who has donated to her GoFundMe campaign. Without your help, this would not have been possible. While Courtney has achieved her original goal of $25,000 raised, this goal was based off her getting a transplant back home at Emory and me taking one month off work to help her. Our relocation to North Carolina, her now five months stay in the hospital, and myself not working this whole time (so I could be by her side and with the kids) has changed things financially. Courtney’s recovery will likely keep me home from work for a couple of more months so we do ask that if anyone would like to make an additional contribution or a first-time contribution to Courtney’s transplant fund, please do and know that it will help a lot and be much appreciated. We are not going to update her goal again but just know that the GoFundMe campaign is still open and accepting donations if you would like to help. Thank you again for all or your support! I am so relieved that Courtney got her lungs and feel that is an amazing thing. I am so honored to have contributed in a small way to this journey. I will share this to see if anyone else would be able to consider helping while she goes through recovery. Please hug her and tell her Nancy Minor said she is one tough cookie and her will and courage would be hard to duplicate. A beautiful child and now a beautiful woman with an amazing determination. In my prayers. I am glad you met my niece Alyssa. I never met you but she would have loved people to help you, that is the way she was. GOOD LUCK. God bless you and your family. We miss our dear friend Alyssa Caricato. Dear Courtney, I am very happy to donate once again to support your continued progress and look forward to hearing that you aren in the very best of health!